A fusion of ancient futures is apparent in this story from ʻŌiwi TV about the arrival of the Mālama Honua crews in Aotearoa at Pt. England Beach near Aukland. Students from the Manaiakalani School Cluster (a group of 12 schools that share the vision of future-focused learning in connected communities that embrace the digital world) met the Mālama Honua crews with songs and ceremony. Russell Burt, principle of the Pt. 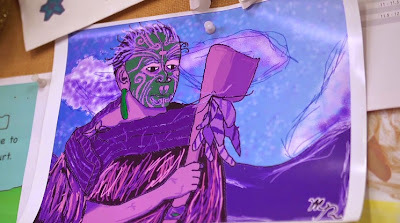 England School referred to the journey of legend of Maui-tikitiki-a-tāranga and his journey to Aotearoa in which he used the Manaiakalani constellation to navigate and called it "ancient wisdom with high-end Polynesian tech". He went on to say, "ancient wisdom applied to new technology equals fantastic opportunity and future and a happy outcome, an outcome of enormous endurance of incredible epic proportions." Later in the video, David Lassner, President of the University of Hawaii System adds "its not traditional versus modern, its using modern and traditional together to prepare these kids for the future." Manaiakalani: High-end Polynesian Tech from Oiwi TV on Vimeo.